INDIANAPOLIS, IND. (August 29, 2018) — Klipsch®, a leading premium global audio company, today announces the debut of its new Reference™ Premiere series speakers. The all-new line is an enhanced version of the company’s award-winning, Reference Premiere series speakers and has been expanded to 16 models­ in three finishes. Now in its second generation, the Reference Premiere speakers feature the latest technological audio advancements, premium material upgrades, and dramatic cosmetic details. The series uses proprietary Tractrix® horn technology to improve high-frequency response and extension, while enhancing imaging and dynamics. An exclusive Linear Travel Suspension titanium tweeter maximizes dynamics, delivering detailed performances. A new, ultra-premium vented tweeter further smoothes high frequency response for enhanced detail and clarity. Klipsch signature copper Cerametallic™ woofers and Tractrix ports provide powerful low frequencies while minimizing distortion and maximizing efficiency. New premium materials and dramatic design features used in the Klipsch Reference Premiere series are the epitome of modern elegance. The speakers come in three furniture-grade finishes – ebony, walnut, and hand-sanded piano gloss black. Cast aluminum feet give the speakers a modern appearance and minimize contact with the floor to reduce resonance. Signature Klipsch copper trim rings accentuate the tweeter and woofer, which can also be concealed by sturdy yet flexible magnetic grilles. “We’ve taken the successful foundation of our best-selling speakers and enhanced them to create the hands-down, best-sounding premium speakers on the planet at these price points,” said Michael Buratto, product manager for Klipsch. The 16 new Reference Premiere series models consist of five floorstanding towers (RP-8000FA Dolby Atmos® enabled, RP-8000F, RP-6000F, RP-5000F, and RP-4000F), three bookshelf speakers (RP-600M, RP-500M and RP-400M), five center channel speakers (RP-504C, RP-404C, RP-600C, RP-500C, and RP-400C), and three surround speakers (RP-502S, RP-402S, and the innovative, dual-purpose RP-500SA that functions as a Dolby Atmos elevation speaker or a rear/side wall-mountable surround). Klipsch will introduce two accompanying powered subwoofer lines in the coming weeks. 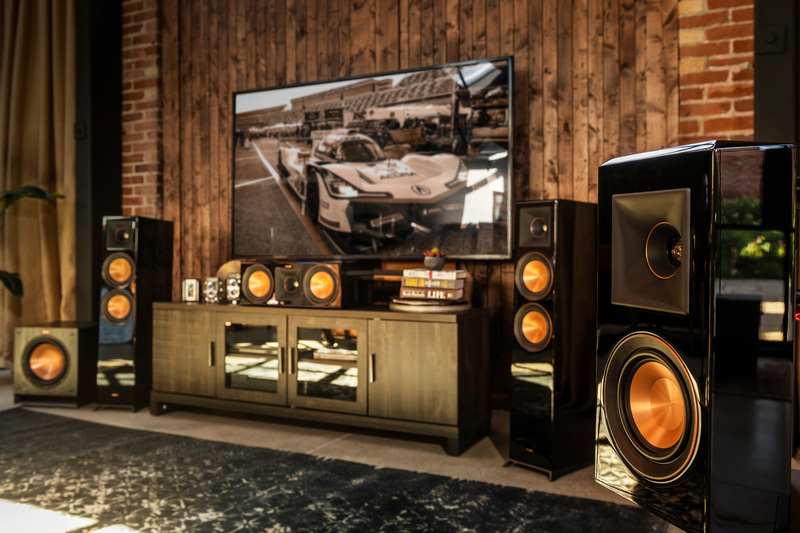 Price points for the new Klipsch Reference Premiere series span U.S. MSRP price points ranging from $598-$2,498 for a pair of floorstanding speakers, $349-$649 for a pair of bookshelf models, $299-749 for a center channel, $499-899 for a pair of surrounds, and $599 for a pair of dual-purpose RP-500SA speakers. They are available to order at select retailers and at Klipsch.com. For more information on the Klipsch brand and its Reference Premiere series speakers, visit Klipsch.com. Klipsch®, Keepers of the Sound®, and Tractrix are trademarks of Klipsch Group, Inc., registered in the U.S. and other countries. Reference™ is a trademark of Klipsch Group, Inc.
Dolby Atmos® enabled products are manufactured under License from Dolby Laboratories. Dolby Atmos is a registered trademark of Dolby Laboratories.